The goal of this project is to implement a few simple geometry processing algorithms such as mesh smoothing and subdivision. This will allow one to gain intuition for how to modify meshes programmatically. The C++ starter code can be used if you desire. Open the solution or run make to build meshpro and mesh_view. I have included one mesh in the meshes subdirectory but more are available in a zip file. See Project 1 for more information on the starter code. 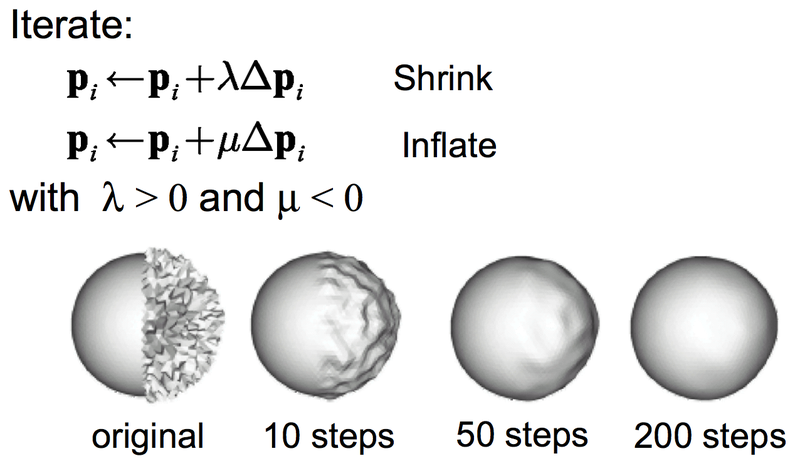 Implement Taubin smoothing. You can implement this in R3Mesh::Taubin(double lambda, double mu, int iters). You can implement this subdivision scheme in R3Mesh::Loop(). 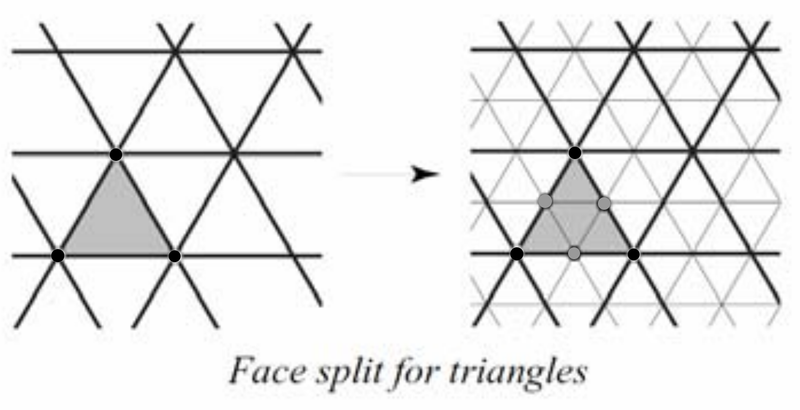 For simplicity, you can assume all mesh faces are triangles: non-triangular faces can simply be skipped. Some care needs to be taken in the implementation because adjacent triangles share vertices in both the original and subdivided mesh (e.g. duplicated vertices are not desireable). Alternatively instead of implementing subdivision you can implement bilateral mesh denoising. Or if you have another interest feel free to propose that and get approval from me. Submit your assignment in a zip file named yourname_project2.zip. Include your code, and screenshots of before/after results of your Taubin smoothing and Loop subdivision. For Loop subdivision use a low polygon model such as bump8x8.off in the meshes archive. Use the E key to turn on viewing of edges to verify that there are more triangles after subdivision. Submit your zip to UVA Collab.